Monday August 13,2018 - Jubilee Party Vice Chairman, David Murathe, has said President Uhuru Kenyatta will support Deputy President William Ruto’s presidential bid in 2022. 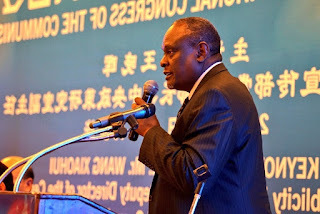 Speaking during a church service and fundraiser at AIC Theta in Gatundu South, on Sunday, Murathe who is a close friend of President also told members of the "Tanga Tanga" team that they are sabotaging Mr Ruto's chances of clinching the Presidency by continuously insinuating that the President is working to ruin Mr Ruto's chances of succeeding him in 2022. Tanga Tanga squad is a team of MPs from Central and Rift Valley regions that is campaigning for Ruto’s presidential bid in 2022. “Yet people are going around preaching despondency,” Murathe said. Murathe concluded by urging Tanga Tanga team to halt their campaigns and concentrate in implementing Uhuru’s Big Four agenda.